Let me make this very plain, I LOVE RAMOS FIZZES!! I like them for brunch, I like them for happy hour, I like them whenever I can get them. The Ramos has almost become my signature cocktail I do it so often, mostly it's my Golden Ramos Fizz because people love it and I always have some kind of orange fruit in the house. But I do it the normal way and with other flavors as well, usually whatever fruit I have handy. Originally the Ramos was called a New Orleans Fizz and it was created by Henry C. Ramos at his bar in Meyer’s restaurant in New Orleans in 1888. 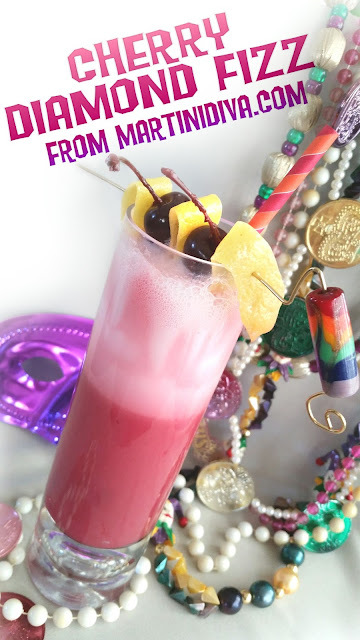 Aside from the sadly abused Pat O'Brien Hurricane, it is probably the most recognized Mardi Gras-NOLA-Fat Tuesday drink. Yes, the Sazerac as well, but it's more of a cocktail aficionado drink, not so much for the masses. But for me, the Ramos reigns on Fat Tuesday. DIRECTIONS: Combine all the liquid ingredients except the ice in a blender and dry blend for a minute to emulsify the egg white and aerate the cocktail. Transfer this to an ice filled cocktail shaker and shake vigorously to chill. Pour into the chilled Collins glass, top off with Champagne, garnish and serve. 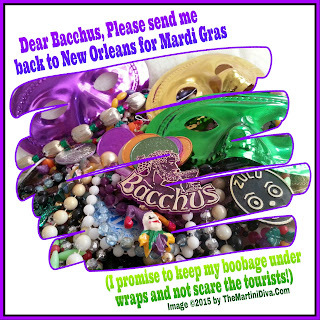 Just remember, when I say "throw me something, mister" I'm not talking beads, I'm talking slide me a down Ramos! Laissez les bon temps (and the Ramos Fizzes) rouler. 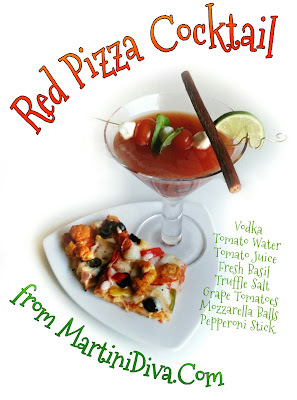 I was challenged to do a Pizza Cocktail, so, yes, I had to go there. In fact, I went there three times and did a White Pizza Cocktail, a Red Pizza Cocktail and then a Margherita Pizza Margarita. 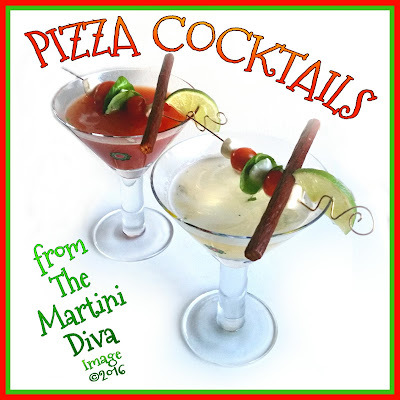 Before you cringe, think of them as Bloody Marys with Italian or Spanish accents. For the Red and White Pizza Cocktails I started with the flavors of my favorite pizza, a Margherita Pizza, using basil, tomato and mozzarella, then added a little truffle salt for some extra punch. 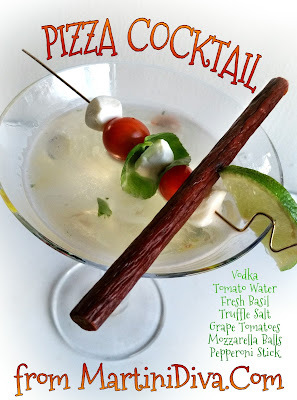 My garnish was a lime slice, a few mozzarella balls, a couple of grape tomatoes and basil leaf. Just for fun I added a pepperoni stick. The white "sauce" version is made with tomato water instead of tomato juice. Tomato water is almost the pure essence of the flavor of the tomato. I simply blended my tomatoes then strained them for 24 hours through coffee filters to get the clear tomato water. It may not look like it tastes like tomato, but it definitely does. For the red "sauce" version, I used half organic tomato juice and half tomato water, then did exactly the same ingredients and procedures as the white pizza cocktail. DIRECTIONS: Add the lime juice and the basil leaves to the cocktail shaker and muddle gently to release the juices and the basil oils. Fill the cocktail shaker with ice then add the vodka, the tomato water and the truffle salt then shake until well chilled. Strain into your cocktail glass, garnish and serve. DIRECTIONS: Add the lime juice and the basil leaves to the cocktail shaker and muddle gently to release the juices and the basil oils. Fill the cocktail shaker with ice then add the vodka, the tomato water, the tomato juice and the truffle salt then shake until well chilled. Strain into your cocktail glass, garnish and serve. 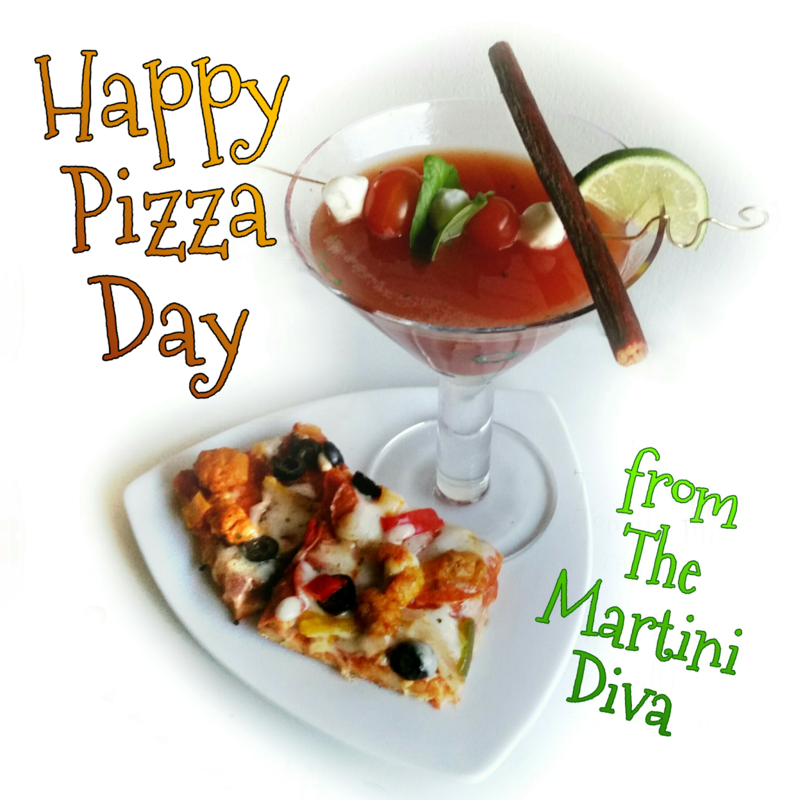 National Cheese Pizza Day is September 5th, Pepperoni Pizza Day is September 20th and National Sausage Pizza Day is October 11th.